Honor Roll Member – Waltermire, James Bruce « Perry High School Alumni Association, Inc.
JB Waltermire grew up on the family farm just south of Perry and graduated from PHS in May 1983. He was commissioned after graduating from the United States Air Force Academy in 1987 with a degree in Computer Science. He graduated from Undergraduate Pilot Training at Vance AFB, OK in 1988 and was selected as a T-38 Instructor Pilot. In 1991 he married Brenda McDaniel in the Christ Lutheran Church of Perry. In 1994 he joined the Louisiana Air National Guard and flew the F-15. He was hired by Delta Air Lines in April 1997 where he continues to fly and is currently flying internationally on Boeing 767-400 aircraft. He joined the Oklahoma Air National Guard in 1999 as officer in charge of Command Post and Inspector General for the 138th Fighter Wing, Tulsa Air National Guard. In 2006 he was the Air National Guard Liaison Officer for Operation Noble Eagle (Air Defense of the US) and Presidential Support on the Joint Chiefs of Staff working in J-3, Homeland Defense. In 2009 Lieutenant Colonel Waltermire joined the 146th ASOS as the Director of Operations and deployed to Afghanistan in support of Oklahoma’s own 45th Infantry Brigade. 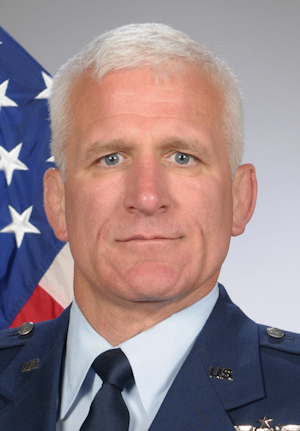 Lieutenant Colonel Waltermire retired from the Oklahoma Air National Guard as the Commander of the 146th Air Support Operations Squadron at Will Rogers Air National Guard Base, Oklahoma City, Oklahoma as of September 30, 2015. Lieutenant Colonel Waltermire was responsible for the combat readiness of a squadron consisting of 65 battlefield airmen who are tasked to provide detailed coordination between Army ground commanders and Air Force combat units. This unique mission requires operating on the battlefield with supported ground maneuver units while simultaneously communicating with tactical air and ground based assets. Lieutenant Colonel Waltermire is a senior pilot with over 2500 military hours and 7000 civilian hours in the T-37, T-38, F-15, and numerous civilian aircraft. Today, instead of doing military duties on his off days from Delta Air Lines, he helps his Dad “Fred” and Mom “Marilyn” on the family farm. He is also very active in cowboy action shooting. JB is married to Brenda McDaniel (also a 1983 PHS graduate) and lives in Stillwater. Their children, Brigette and Sean, are graduates of the “Waltermire Home School of Excellence” and are attending Oklahoma colleges. Brigette is currently a Staff Sergeant with the 137th Special Operations Wing working in public affairs. She is also working on her Masters degree in journalism from the University of Oklahoma. Sean is a junior working on his Bachelor degree in Computer Science at Tulsa University. Bronze Star, Defense Meritorious Service Medal, Meritorious Service Medal, Air Force Commendation Medal with 1 oak leaf cluster, Army Achievement Medal, Air Force Combat Action Medal, Army Combat Action Badge, Joint Meritorious Unit Award, National Defense Service Medal, Afghanistan Campaign Medal, Global War on Terrorism Expeditionary Medal, Global War Terrorism Service Medal, Air Force Expeditionary Service Ribbon with Gold Border, AF Longevity Service with 5 oak leaf clusters, Armed Forces Reserve Medal with 1 hourglass device, AF Training Ribbon, NATO Medal.